Parameter estimation of Fricke-Morse model of biological tissue is widely used in bioimpedance data processing and analysis. Complex nonlinear least squares (CNLS) data fitting is often used for parameter estimation of the model, but limitations such as high processing time, converging into local minimums, need for good initial guess of model parameters and non-convergence have been reported. Thus, there is strong motivation to develop methods which can solve these flaws. In this paper a novel real-time method for parameter estimation of Fricke-Morse model of biological cells is presented. The proposed method uses the value of characteristic frequency estimated from the measured imaginary part of bioimpedance, whereupon the Fricke-Morse model parameters are calculated using the provided analytical expressions. The proposed method is compared with CNLS in frequency ranges of 1 kHz to 10 MHz (beta-dispersion) and 10 kHz to 100 kHz, which is more suitable for low-cost microcontroller-based bioimpedance measurement systems. The obtained results are promising, and in both frequency ranges, CNLS and the proposed method have accuracies suitable for most electrical bioimpedance (EBI) applications. However, the proposed algorithm has significantly lower computation complexity, so it was 20-80 times faster than CNLS. H. Fricke, S. Morse, "The electric resistance and capacity of blood for frequencies between 800 and 4(1/2) million cycles," The Journal of General Physiology, vol. 9, no. 2, pp. 153-167, 1925. K. S. Cole, "Permeability and impermeability of cell membranes for ions," Cold Spring Harbor Symposia on Quantitative Biology, vol. 8, pp. 110-122, 1940. D. Meroni et al., "Healthy and tumoral tissue resistivity in wild-type and sparc-/- animal models," Medical and Biological Engineering and Computing, pp. 1-9, 2016. B. Sanchez, A. S. Bandarenka, G. Vandersteen, J. Schoukens, R. Bragos, "Novel approach of processing electrical bioimpedance data using differential impedance analysis," Medical Enginerring and Physics, vol. 35, no. 9, pp. 1349-1357, 2013. B. Sanchez, E. Louarroudi, E. Jorge, J. Cinca, R. Bragos, R. Pintelon, "A new measuring and identification approach for time-varying bioimpedance using multisine electrical impedance spectroscopy," Physiological Measurement, vol. 34, no. 3, pp. 339-357, 2013. B. Sanchez, E. Louarroudi, R. Pintelon, "Time-invariant measurement of time-varying bioimpedance using vector impedance analysis," Physiological Measurement, vol. 36, no. 3, pp. 595-620, 2015. S. Prakash et al., "Ex vivo electrical impedance measurements on excised hepatic tissue from human patients with metastatic colorectal cancer," Physiological Measurement, vol. 36, no. 2, pp. 315-328, 2015. A. G. Gheorghe, C. V. Marin, F. Constantinescu, M. Nitescu, "Parameter Identification for a New Circuit Model Aimed to Predict Body Water Volume," Advances in Electrical and Computer Engineering, vol. 12, no. 4, pp. 83-86, 2012. P. Van Liedekerke, M. Palm, N. Jagiella, D. Drasdo, "Simulating tissue mechanics with agent-based models: concepts, perspectives and some novel results," Computational Particle Mechanics, vol. 2. no. 4, pp. 401-444, 2015. M. T. Wilson, M. Elbohouty, L. J. Voss, D. A. Steyn-Ross, "Electrical impedance of mouse brain cortex in vitro from 4.7 kHz to 2.0 MHz," Physiological Measurement, vol. 35, no. 2, pp. 267-281, 2014. 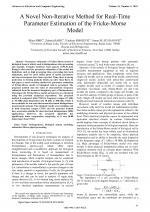 T. J. Freeborn, B. Maundy, A. S. Elwakil, "Extracting the parameters of the double-dispersion Cole bioimpedance model from magnitude response measurements," Medical and Biological Engineering and Computing, vol. 52, no. 9, pp. 749-58, 2014. Y. Yang, W. Ni, Q. Sun, H. Wen, Z. Teng, "Improved Cole parameter extraction based on the least absolute deviation method," Physiological Measurement, vol. 34, no. 10, pp. 1239-1252, 2013. I. Nejadgholi, H. Caytak, M. Bolic, I. Batkin, S. Shirmohmmadi, "Preprocessing and Parameterzing Bioimpedance Spectroscopy Measurements by Singular Value Decomposition," Physiological Measurement, vol. 36, no. 5, pp. 983-999, 2015. M. Simic, Z. Babic, V. Risojevic, G. Stojanovic, A. A. Ramos, "System for Rapid and Automated Bioimpedance Measurement," In Proceedings of the SDPS Conference, Dallas, Texas, USA, pp. 242-247, 2015. S. Rossi et al., "A low power bioimpedance module for wearable systems," Sensors and Actuators A: Physical, Vol. 232, pp. 359-367, 2015. S. Kaufmann, A. Malhotra, G. Ardelt, M. Ryschka, "A high accuracy broadband measurement system for time resolved complex bioimpedance measurements," Physiological Measurement, vol. 35, no. 6, pp. 1163-1180, 2014. P. J. Soh, G. A. Vandenbosch, M. Mercuri, D. M. P. Schreurs, "Wearable wireless health monitoring: Current developments, challenges, and future trends," IEEE Microwave Magazine, vol. 16, no. 4, pp. 55-70, 2015. J. Wang, J. Liang, F. Gao, L. Zhang, Z. Wang, "A method to improve the dynamic performance of moving average filter-based PLL," IEEE Transactions on Power Electronics, vol. 30, no. 10, pp. 5978-5990, 2015. J. Ferreira, F. Seoane, A. Ansede, R. Bragos, "AD5933-based Spectrometer for Electrical Bioimpedance Applications," Journal of Physics: Conference Series, vol. 224, no. 1, pp. 012011, 2010. E. W. Karas, S. A. Santos, B. F. Svaiter, "Algebraic rules for computing the regularization parameter of the Levenberg-Marquardt method," Computational Optimization and Applications, pp. 1-29, 2016. 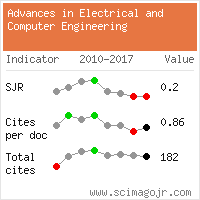 Citations for references updated on 2019-04-21 17:48 in 137 seconds.